When natural stone panels are used as cladding for retail stores, high-rise apartments, hotels, and other structures, both contractors and building owners hope that the stone will remain perfectly flat over time. Unfortunately, this isn’t always the case. 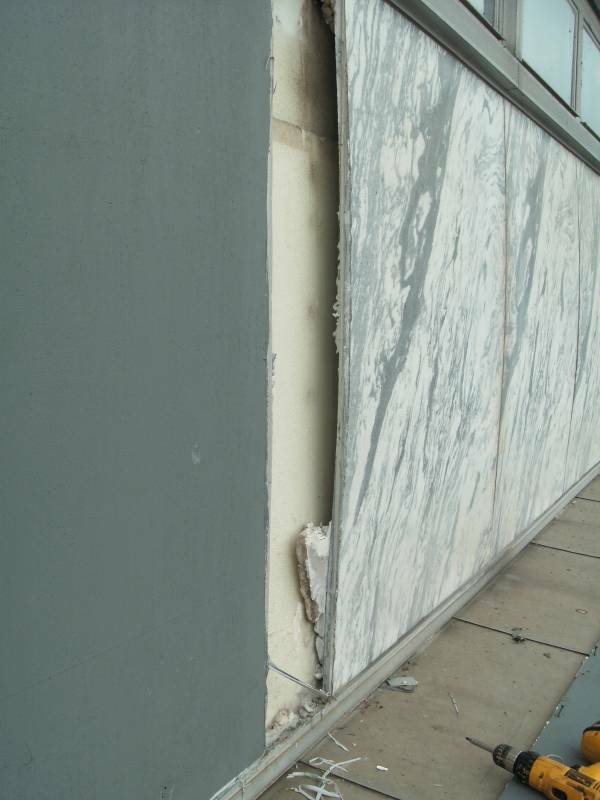 When stone panels are installed outside and exposed to the elements, bowing may occur. In stone panel bowing, the stone facade is permanently damaged and takes on a concave or convex appearance. In addition to being an unsightly problem, bowing reduces flexural strength and increases the chances of stone failure. This can lead to costly repairs down the road and increase the risk of injury. The good news is that choosing the right stone panels can completely eliminate this costly and potentially dangerous issue. One of the major causes of bowing is thermal hysteresis. This is particularly a problem with thin-veneer marble, in large part because of the coarse veins it often contains and its uneven strength. The outside-facing surface of the stone panel expands and contracts as it is exposed to warmer and then cooler temperatures. In some cases the panel does not contract fully, which can lead to bowing. A greater load is placed on the stone anchors as a result, which exacerbates the problem and further increases the risk of failure. The entire surface of our marble panels is attached to an aluminum honeycomb backing using aviation epoxy. This eliminates weak spots and gives the marble cladding superior rigidity and flexural strength. Various granite, marble, and travertine panels by StonePly have been subjected to testing designed to determine whether a panel is likely to bow. In this accepted test, 40 heating and cooling cycles are considered sufficient to show a stone does not have a tendency to bow. StonePly panels were subjected to 200 cycles and showed no noticeable bowing or warping. The ability of StonePly natural stone panels to resist bowing is just one property that makes them preferable to heavy slab stone for many applications. To learn more about the many advantages of our natural stone panels and our track record of success, visit the StonePly website. If you think our natural granite, marble, limestone, or travertine panels might be the right choice for your project, feel free to get in touch with us any time to request a free initial consultation and a personalized estimate. You can call us at 903-454-4630 or complete the brief form on our contact page.